The online music player was an addition to the site after several requests. People wanted to be able to listen to the song online without downloading the file to their computer. After some searching on google, I found a player* that would work the way I wanted. 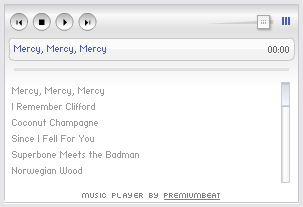 I figured out how to modify the playlist script to allow playlists to be generated directly from the site to display the songs I wanted.